Composed by Various. Arranged by Jonathon Robbins. This edition: Paperback. Collection. Popular, Play Along. Collection and 3 CDs. With Text Language: English. 160 pages. Published by Santorella Publications (SP.TS400). 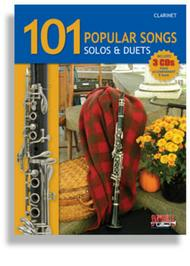 Santorella Publications is proud to present 101 Popular Songs for Clarinet. After countless requests we have brought it all together under one roof. It has been decades since a brass or reed player could find so many recognizable songs, from assorted genres in a single collection. Also available in accommodating keys for Trumpet, Flute, Alto Sax & Trombone in both solo & duet forms. 101 Popular Songs includes a variety of well-known Original Classics, Wedding Classics, Sacred Hymns, Patriotic Songs, Jazz Standards & Christmas Carols. Each edition includes three (3) Piano Accompaniment CDs - with over 100 tracks including classical & jazz duets. Every horn player will have a unique opportunity to play along with the greatest studio musicians in Los Angeles. Each edition is geared towards a particular instrument in the Classical & Jazz Duets sections which is recorded in a "music minus one" fashion. Little Cradle Song - Tell Me Fair Ladies - The Organ Grinder - Allegro, Mozart - Minuet, J.S. Bach - Andante, Mozart - Russian Song - Aria, J.S. Bach - Serenade - German Dance, Haydn - Gavotte - Old French Song - Turkish March - Andante, Haydn - Flight Of The Bumblebee - A Little Piece - Bouree - Symphony No. 40 - Allegretto - Spinning Song - Bridal Chorus - Wedding March - Ave Maria, Schubert - Jesu Joy of Man's Desiring - Pachelbel's Canon - Ode to Joy - Simple Gifts - Trumpet Voluntary - Two Minuets - Ave Maria, Bach - Moonlight Sonata - Nearer My God To Thee - Fairest Lord Jesus - Rock of Ages - Holy, Holy, Holy - Faith of Our Fathers - The Little Brown Church in the Vale - A Mighty Fortress is Our God - Abide With Me - The Lord is My Shepherd - Bringing in The Sheaves - Jesus Loves Me - Eternal Father Strong To Save (Navy Hymn) - He Leadeth Me - Stand Up For Jesus - America the Beautiful - Amazing Grace - When Johnny Comes Marching Home - Hail to the Chief - You're a Grand Old Flag - Marine's Hymn - Dixie - Battle Hymn of the Republic - Pomp and Circumstance - Yankee Doodle - America, My Country "Tis of Thee - Washington Post March - Columbia the Gem of the Ocean - Anchors Aweigh - Over There - Yankee Doodle Boy - The Star-Spangled Banner - Semper Fidelis - The Caissons Go Rolling Along - The Stars and Stripes Forever - The Thunderer - Hot Time in the Old Town Tonight - AIexander's Ragtime Band - I Want a Girl - For Me and My Gal - Chinatown My Chinatown - Little Brown Jug - Fascination - Melancholy Baby - You Made Me Love You - Bill Bailey - When The Saints Go Marching In - Rock-a-Bye Your Baby - St. Louis Blues - After You've Gone - Baby Face - Swanee - The Entertainer - Blue Boppin' Bossa - Ba-do-ba-dee-bop - Lazy Summer - The "Do Nothing" Blues - Kickin' Back - Away in a Manger - Deck the Halls - First Noel - Hark! The Herald Angels Sing - It Came Upon a Midnight Clear - Jingle Bells - Joy to the World - Let There Be Peace of Earth - O Come All Ye Faithful - O Little Town of Bethlehem - Silent Night - We Three Kings of Orient Are - We Wish You a Merry Christmas. 16 of 44 people found this review helpful.